He's acted in small roles in Nandalala, Attakathi, Mugamudi and Madha Yaanai Koottam. But nothing brought him the fame and acclaim that Studio Green's Madras has done. The film which has just released to rave reviews, with its special focus on the realistic portrayal of life in North Madras. Playing the key role of Anbu, the best friend of hero Karthi, is actor Kalaiyarasan, whose life hasn't been the same ever since. "When I went to theatre visits after the release, I had to be escorted by security guards like some big hero, because of the overwhelming crowds!" he grins happily. "Madras has changed my life completely! Now I'm flooded with requests for autographs and photos. At Albert Theatre, people were shouting 'Anbu Anna'." Kalaiyarasan, a graduate in Computer Applications from SRM College,thanks Mysskin for giving him a break in two movies. Later, in Renjith's debut flick, Attakathi, Kalaiyarasan he played the guy the heroine marries. But for Madras, he underwent three screen tests before he was okayed for the role of Anbu. The natural vibes with Karthi are the highlight of the movie. He gives all credit to the hero, "I was hesitant to treat him in a friendly manner since he's a star. But he himself came and put his hand on my shoulder the first day and put me at ease. He was also very considerate towards everyone. He would give the counter cues from behind the camera and request for a breaks when anyone had very lengthy scenes. He would patiently wait during our many retakes." Ask him about the romantic scenes he did so naturally and he grins, "Luckily my wife hasn't seen the movie yet!" 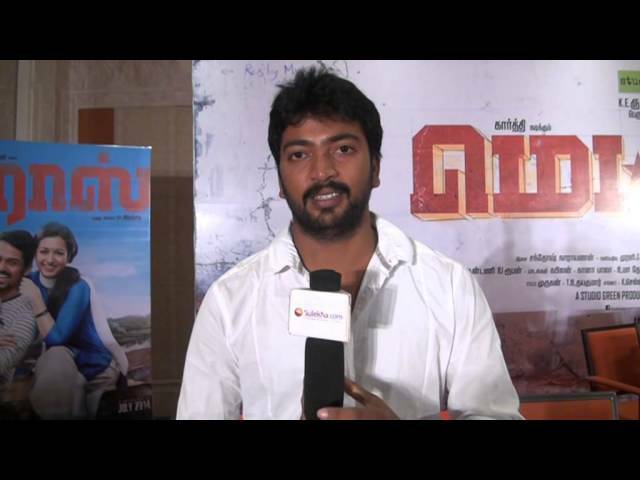 His next film is Urumeen where he plays a the main negative character. Offers of hero roles are also pouring in.